“The light and lines in this photograph!! 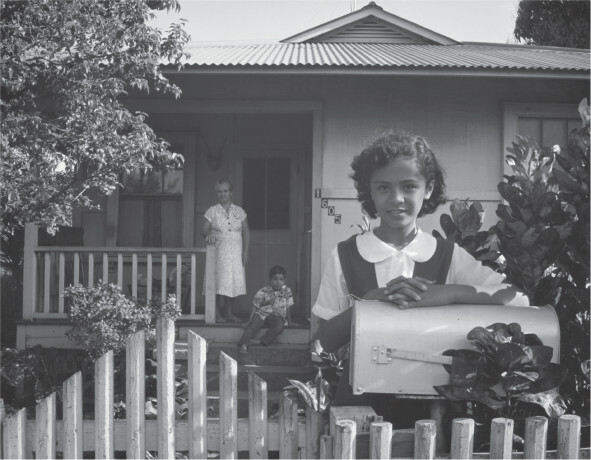 The girl behind the mailbox looks nice and there is so much honesty in his subjects and works even though you know they were constructed for a specific composition.” – Bernadette B. “The first one caught my eye captures family life in Hawai`i very well.” – Anthony H.
“I feel like I’m about to enter their life with a warm e komo mai” – Stef M.
“It is perfectly composed and the light balance is flawless. It also evokes the ethos of the 50’s extremely well.” – Anthony W.
“It looks like it could’ve been taken yesterday. Nothing changes too quickly here.” – Andrew L.
How does this image captivate you? Did the artistic composition catch your eye? Do you have a personal connection to the subject?